After some 60-years keeping aquariums I’m quite familiar with Murphy’s law – what will go wrong, will, and at the most inconvenient time – and that I have corals now for close to 30-years attest to the fact that have had some success at anticipating what can go wrong: backup systems, generators, etc. In the long run however, Murphy will always find ways to get you with something the aquarist never anticipated. Two weeks ago when I was visiting friends in Cleveland I got a phone call around noon from my son saying, “Dad I have bad news: the house is on fire. I’m across the street and there are 6 fire trucks and the fireman are in the basement where the reef tank is.” Fortunately, my son was home. After the fireman left I asked my son, if possible, to try to get the main circulation pump running by using an extension card. He was able to do this, if he hadn’t the entire reef tank’s animals would have died of oxygen depletion. It was touch and go because two surgeon fish did die. Everything else connected to the system was shut down. All this took place around noon, and I was able to get a plane back to Portland, Maine from Cleveland, OH. I arrived at about 1:30AM the next day. Everything in the basement was covered with acrid black ash, with plenty of ash in the water. There were broken fluorescent tubes in the refugium. After a close inspection I discovered that a 4-foot fixture, with a plastic housing, had melted and fallen into my refugium, which was connected to the system. There even were broken tubes lying on the bottom of the refugium. The skimmers were not running and had been knocked over by the firemen. All of the fish were hiding and the corals were slimmed up. The question for me now was what to do. 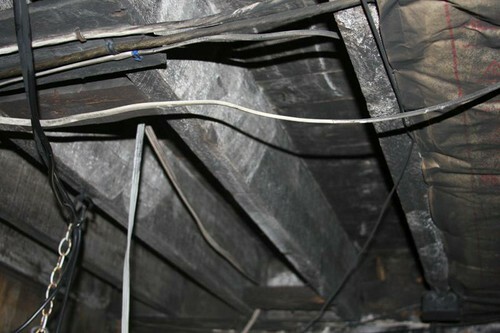 This is a picture of the floor joists directly above where the fire started. The first thing I did was to dump about 2 lbs of carbon into the system, after that I got both skimmers working – together they process about 3000-gallons/hour. Now it was about 3AM, and some of the fish started to come out of hiding. While I was doing all of this I felt that the situation was hopeless – how could the animals not be poisoned by burn plastic and toxic metal from the burnt fixture. Around 4AM I took a break and looked in the mirror, and discovered that I looked like someone who worked in a coal mine, but was somewhat encouraged because the fish and corals were actually looking better. By noon of the next day, life in the reef tank appeared almost normal. The last thing I was able to do was to change 200-gallons of water. I always try to keep that much new saltwater on hand. It is now 2-weeks since the fire, and much to my amazement I only lost the two surgeonfish, all of the corals survived. It took 5 people sent by the insurance company over a week to clean up the mess. A few days ago the Insurance company sent down an expert to try to ascertain how the fire started. He carefully examined the burnt plastic, especially the fluorescent fixture, which by now was almost unrecognizable. He eventually came to the conclusion that one of the ballasts either shorted or overheated and went on fire. Something he noticed also was that the filtration room was extremely humid – it was very humid, hazy, and hot in Portland at the time if the incident. In fact, the walls and floor of the filtration room were wet, and there was even drops of water on some of the wiring. Whether this excessive moisture shorted the ballast, or it overheated was not possible to ascertain. I’m still not sure how to handle this potential danger – a dehumidifier, air conditioner, different wiring or circuit breakers. Maybe some of our readers have suggestions. One thing is all too clear: this is a potentially dangerous matter. If no one were home the house could well have burnt down.